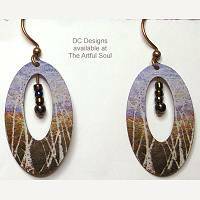 DC Designs jewelry highlights the work of two Colorado artists: David Clack's landscape and nature photography, and Shelly Hearne who paints nature in vivid color and abstract shading. From their bodies of work come snippets of patterns found in nature captured as giclee prints directly onto stainless steel. 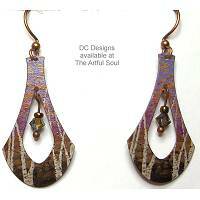 The earrings are printed on BOTH SIDES, they are durable and ultra lightweight. Earwires are antique copper plating over steel, nickel-free and hypo-allergenic. 1-7/8 inches long including copper plated, nickel-free steel earwire, 3/4 inch across. The oval cut from lightweight steel is printed on both sides, depicting a snippet of photo by David Clack. 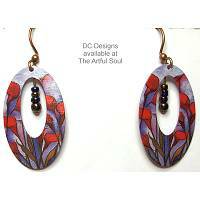 The giclee print has satin texture, the flower garden motif is dark purples and oranges. Tiny beads dangle at open center. 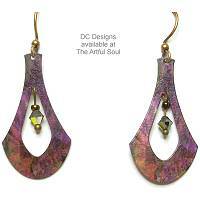 1-7/8 inches long including copper plated, nickel-free steel earwire, 3/4 inch across. The kite shape cut from lightweight steel is printed on both sides, depicting a snippet of painting by Shelly Hearne. 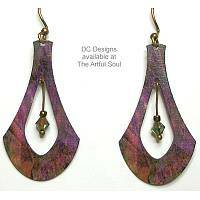 The giclee print has satin texture, the colors are natural brown and off-white with lavender and orchid. Crystal dangles at open center. 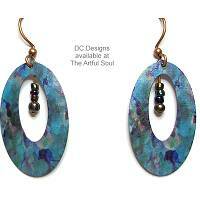 1-7/8 inches long including copper plated, nickel-free steel earwire, 3/4 inch across. The kite shape cut from lightweight steel is printed on both sides, depicting a snippet of photo by David Clack. The giclee print has satin texture, the colors are dark blue, aqua and forest green. Crystal dangles at open center. 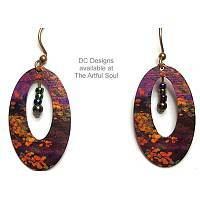 1-7/8 inches long including copper plated, nickel-free steel earwire, 3/4 inch across. The kite shape cut from lightweight steel is printed on both sides, depicting an impressionist scene. The giclee print has satin texture, the colors are aqua, green and lavender. Crystal dangles at open center. 1-7/8 inches long including copper plated, nickel-free steel earwire, 3/4 inch across. 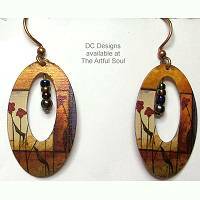 The oval cut from lightweight steel is printed on both sides, depicting a snippet of painting by Shelly Hearne. The giclee print has satin texture, red lilies on lavender background. Tiny beads dangle at open center. 1-7/8 inches long including copper plated, nickel-free steel earwire, 3/4 inch across. 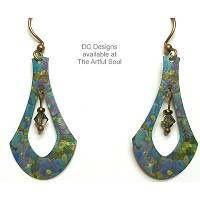 The kite shape cut from lightweight steel is printed on both sides, depicting an impressionist scene. The giclee print has satin texture, the colors are lavender, yellow and pale blue. Crystal dangles at open center. 1-7/8 inches long including copper plated, nickel-free steel earwire, 3/4 inch across. The kite shape cut from lightweight steel is printed on both sides, depicting an impressionist scene. The giclee print has satin texture, the colors are purple, deep rose pink and green. Crystal dangles at open center. 1-7/8 inches long including copper plated, nickel-free steel earwire, 3/4 inch across. 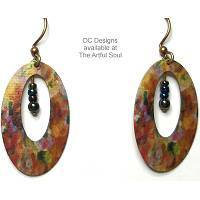 The oval cut from lightweight steel is printed on both sides, depicting a snippet of painting by Shelly Hearne. The giclee print has satin texture, the red flowers pop out from amber color background. Tiny beads dangle at open center. 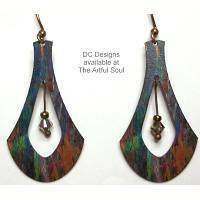 2-1/8 inches long including copper plated, nickel-free steel earwire, 15/16 inch across. The kite shape cut from lightweight steel is printed on both sides, depicting a snippet of photo by David Clack. The giclee print has satin texture, the motif is like stained woodgrain in orange browns, peacock blue-greens. Crystal dangles at open center. 1-7/8 inches long including copper plated, nickel-free steel earwire, 3/4 inch across. The oval cut from lightweight steel is printed on both sides, depicting a snippet of photo by David Clack. The giclee print has satin texture, the watery motif is deep aqua, green and navy. Tiny beads dangle at open center. 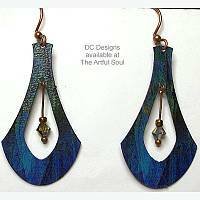 2-1/8 inches long including copper plated, nickel-free steel earwire, 15/16 inch across. 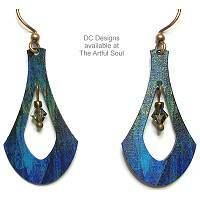 The kite shape cut from lightweight steel is printed on both sides, depicting an impressionist scene. The giclee print has satin texture, the colors are purple, deep rose pink and green. Crystal dangles at open center. 1-7/8 inches long including copper plated, nickel-free steel earwire, 3/4 inch across. The oval cut from lightweight steel is printed on both sides, depicting a snippet of photo by David Clack. 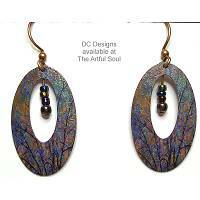 The giclee print has satin texture, the motif from a tree offers branches and foliage in navy blues, emerald, golds. Tiny beads dangle at open center. 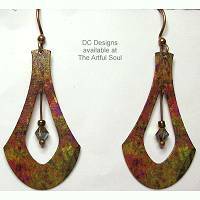 2-1/8 inches long including copper plated, nickel-free steel earwire, 15/16 inch across. The kite shape cut from lightweight steel is printed on both sides, depicting a snippet of photo by David Clack. The giclee print has satin texture, the colors are dark blue, aqua and forest green. Crystal dangles at open center. 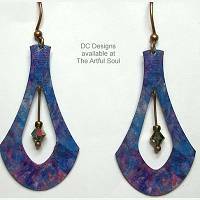 2-1/8 inches long including copper plated, nickel-free steel earwire, 15/16 inch across. The kite shape cut from lightweight steel is printed on both sides, depicting a snippet of photo by David Clack. The giclee print has satin texture, the colors are meadow greens and deep raspberry. Crystal dangles at open center. 1-7/8 inches long including copper plated, nickel-free steel earwire, 3/4 inch across. The oval cut from lightweight steel is printed on both sides, depicting a snippet of photo by David Clack. The giclee print has satin texture, the foliage motif has oranges, golds and greens. Tiny beads dangle at open center. 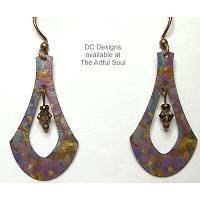 2-1/8 inches long including copper plated, nickel-free steel earwire, 15/16 inch across. The kite shape cut from lightweight steel is printed on both sides, depicting an impressionist scene. The giclee print has satin texture, the colors are blue, plum, aqua and pink. Crystal dangles at open center.